The just ended "We Love Freebies!" promotion cause a dent on accessory stock. As well as leaving a gaping hole of no promotion at the moment. Well, the promotion have to stop eventually. But apparently not now! While stock last. Most of the item only have 1 in stock. So this should be a quick one. Enjoy! Purchase Arduino and accessory in single order from H&T on-line shop. 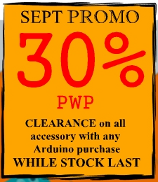 30% discount is offered for item in Accessory tab/section only. Choose Maybank Bank In payment method so that no payment is made on on-line order completion. Email, sms or online chat wtih H&T representative and state your interest. You will be replied back with invoice stating new purchase amount with 30% discount applied. Complete the order with Maybank bank in payment to the amount as stated.